Part 1 Types and roles of active and intelligent packaging: Active and intelligent packaging: An introduction; Oxygen, ethylene and other scavengers; Antimicrobial food packaging; Non-migratory bioactive polymers (NMBP) in food packaging; Time-temperature indicators (TTIs); The use of freshness indicators in packaging; Packaging-flavour interactions; Moisture regulation. Part 2 Developments in modified atmosphere packaging (MAP): Novel MAP applications for fresh-prepared produce; MAP, product safety and nutritional quality; Reducing pathogen risks in MAP-prepared produce; Detecting leaks in modified atmosphere packaging; Combining MAP with other preservation techniques; Integrating MAP with new germicidal techniques; Improving MAP through conceptual models. Part 3 Novel packaging and particular products: Active packaging in practice: Meat; fish; Active packaging and colour control: The case of meat; The case of fruit and vegetables. Part 4 General issues: Optimizing packaging; Legislative issues relating to active and intelligent packaging; Recycling packaging materials; Green plastics for food packaging; Integrating intelligent packaging, storage and distribution; Testing consumer responses to new packaging concepts; MAP performance under dynamic temperature conditions. Packaging continues to be one of the most important and innovative areas in food processing. 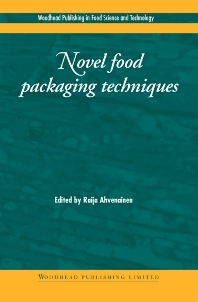 Edited by a leading expert in the field, and with its distinguished international team of contributors, Novel food packaging techniques provides an authoritative and comprehensive review of the key trends. Part one discusses the range of active packaging techniques such as the use of oxygen and other scavengers, moisture regulation and antimicrobial packaging in food preservation. It also covers the use of intelligent systems such as time-temperature and freshness indicators to assess food quality. Part two reviews developments in modified atmosphere packaging (MAP) and its role in enhancing product safety and quality. Part three describes packaging applied in practice to particular products such as meat and fish. Part four covers other key issues such as packaging optimisation, the legislative context, sustainable packaging and consumer attitudes. Novel food packaging techniques is a standard reference for the food industry in optimising the use of packaging to improve product safety and quality.